Meet Mr. R. Most commonly asked question I get about him…”Are those real glasses”? Yes. Yes, they are. 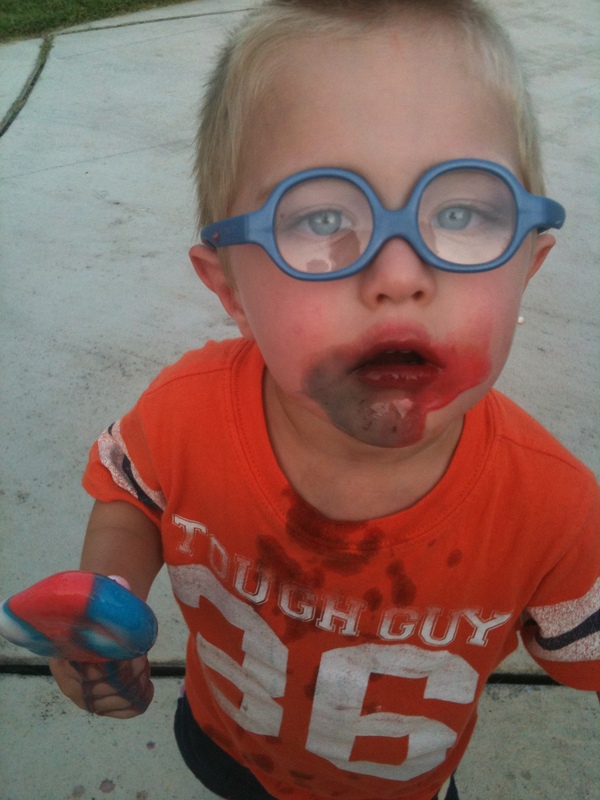 (Who would put fake early Elton John era glasses on a 2 year old “just for fun”?) They are bifocals, as a matter of fact. Fortunately, his good looks and charm allow him to pull off the glasses nicely, thank you very much. Mr. R is the child most likely to be put out on my front porch with a “Free to Good Home” sign on him. I say this with great love and affection, but let me tell you….there are days where I have thought of calling my mother and saying “please come pick him up”. Fortunately for him, she lives three hours away in Pennsylvania, so he has been saved on more than one occasion by sheer logistics. He’s also got the cutest little voice and infectious giggle you ever did hear. Much higher than his brothers, it makes almost everything he says sound oh-so-adorable. Except when he repeats the same thing over. And over. And over. (In the van on the way home. “Chicken Nuggets. Mama. I want Chicken Nuggets”. Multiply that by 50 and you have an idea of how the 45 minute drive home went). All in all, he makes each day more interesting, and causes more than a few giggles around our household. At least you’ll always know what he’s eaten!